Boxford Church was never the most interesting of Berkshire churches. It was traditionally thought to have been built in the 13th century to a standard plan: nave and chancel. The windows were replaced and a western tower added in the 15th century. The north aisle was built in 1841. The original tower collapsed in 1657 and fell into the garden of a prominent local Quaker named Oliver Sanson who was in the middle of an ongoing feud with the rector, Jacob Anderton, over the payment of tithes. He refused to let the building materials be recovered, saying, "As God has sent them to me, no man shall take them away." So the present tower was not erected for another thirty years. There are few fittings of interest inside. The Royal Arms of Queen Elizabeth I painted over the chancel arch are sadly fragmentary, but there are two fonts (Restoration and Edwardian) and a 17th century mural monument in memory of the same educated rector, with decoration in the form of books and ribbons for tying them up. There is an old chest with the date 1683 written in nails, but best of all is the fine Jacobean six-sided pulpit, complete with sounding board. The whole interior was somewhat over remodelled in 1908. 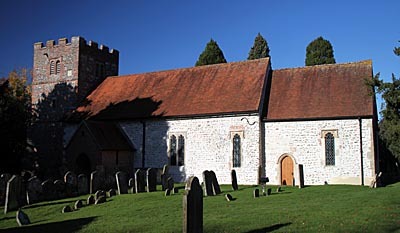 True, the chancel has always had 'long-and-short' quoins, indicating Saxon origins. However, this seems to have been doubted by some architectural historians. Finally, proof came during major restoration work undertaken in 2010. Shocked architect Andrew Plumridge from Peter Scott & Partners stripped back Victorian render to reveal a small oak framed Saxon window in the northern chancel wall. 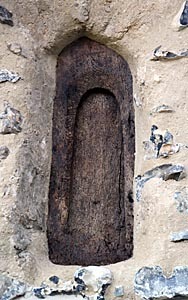 It even has its original little shutter and is the oldest working wooden window in the Country. So the first church was put up by the monks of Abingdon Abbey, probably in the 10th century. Just 2ft by 1ft, the little window is now displayed on the exterior for all to see. This is NOT the official Boxford Church website. Please do NOT mail us about use of the church. Visit the C of E's Church Near You website instead.